Your Mazda is equipped with the following types of SRS air bags. SRS air bags are designed to work together with the seat belts to help to reduce injuries during an accident. The SRS air bags are designed to provide further protection for passengers in addition to the seat belt functions. Be sure to wear seat belts properly. The pretensioners operate differently depending on what types of air bags are equipped. 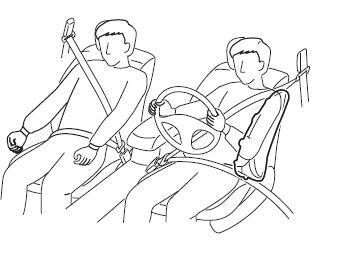 For details on the seat belt pretensioner operation, refer to the SRS Air Bag Deployment Criteria (page 2-55 ). The front seat belt pretensioners are designed to deploy in moderate or severe frontal, near frontal collisions. In addition, during a side collision, the pretensioner operates on the side in which the collision occurs. The rear outboard seat belt pretensioners are designed to deploy in moderate or severe frontal, near frontal collisions. The driver's air bag is mounted in the steering wheel. When air bag crash sensors detect a frontal impact of greater than moderate force, the driver's air bag infl ates quickly helping to reduce injury mainly to the driver's head or chest caused by directly hitting the steering wheel. For more details about air bag deployment, refer to "SRS Air Bag Deployment Criteria" (page 2-55 ). The infl ation of the driver's dual-stage air bag is controlled in two energy stages depending on the driver's seat position. The driver's seat slide position sensor is located under the driver's seat. The sensor determines whether the driver's seat is forward of or behind a reference position and sends the seat position to the diagnostic module (SAS unit). The SAS unit is designed to control the deployment of the driver's air bag depending on how close the driver's seat is to the steering wheel. The front passenger air bag is mounted in the front passenger instrument panel. The infl ation mechanism for the front passenger air bag is the same as the driver's air bag, as mentioned above. The side air bags are mounted in the outboard sides of the front seatbacks. When the air bag crash sensors detect a side impact of greater than moderate force, the system infl ates the side air bag only on the side in which the vehicle was hit. The side air bag infl ates quickly to reduce injury to the driver or front passenger's chest caused by directly hitting interior parts such as a door or window. The curtain air bags are mounted in the front and rear window pillars, and the roof edge along both sides. When the air bag crash sensors detect a side impact of greater than moderate force, the curtain air bag infl ates quickly and helps to reduce injury mainly to the rear outboard passenger's head caused by directly hitting interior parts such as a door or window. Refer to Warning Sound is Activated on page 7-45 .